Band members: Eva Briegel (vocals), Simon Triebel (guitar), Jonas Pfetzing (guitar), Andres Herde (bass), Marcel Römer (percussion). The band members that comprise Juli have known each other since their school days in Gießen. The young musicians started out as the group Sunnyglade in 1999 singing songs in English. Though bestowed with various awards, the band members were not satisfied with their performance. They just could not express in English the depth of thought and feeling that they wanted to convey with their music. So in 2001 the band changed its name to Juli and started writing their lyrics in German -- a decision that won them a contract with Universal Music and a hit debut album entitled Es ist Juli. Their first single "Die perfekte Welle" spent 16 weeks in the Top 10 and the LP quickly sold a half million copies. 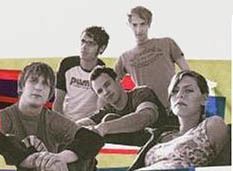 For the single "Geile Zeit" the band took home first prize in the 2005 Bundesvision Song Contest. Juli is one of a growing number of German bands in recent years to completely debunk the myth that songs have to be in English in order meet with widespread success in rock music. Alongside Silbermond, Wir sind Helden, Rosenstolz, and 2raumwohnung, Juli is helping make German-language music en vogue for a new generation. With their melancholy guitar sound, the quintet at times comes across as sensitive and fragile, but in other songs they are defiant and boisterous. At both extremes, they are consistently passionate and emotional.  Their song "Die perfekte Welle" was pulled from the radio following the tsunami disaster in Southeast Asia because of the ambiguity of the lyrics about "the perfect wave".  The band name Juli derives from a song of the same name by the Berlin band Tex.